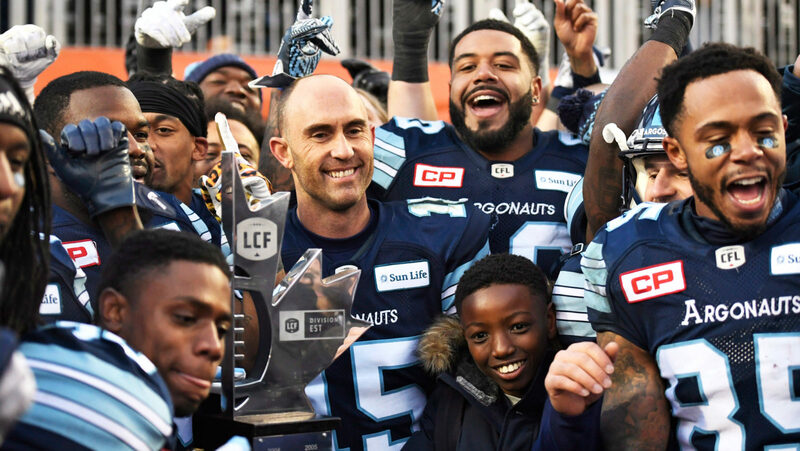 Home » Uncategorized » Toronto Wins the CFL East Final and So Much More. Toronto Wins the CFL East Final and So Much More. 24,929 fans went to watch a CFL game in Toronto today. That alone says a lot. Throughout the week cynics of Toronto football fans cried that BMO would be filled with Rider fans. They were wrong. Of course the Green and White were well represented but make no mistake, on this day BMO Field was home advantage Toronto. Many believed that a move to BMO Field was all that would be required to cure the ills off the Double Blue. They were wrong. But what people did think the Argos could achieve playing at BMO Field was on full display Sunday afternoon. If you were new to the scene there really weren’t many surprises. From an offensive stand point the Argos weren’t very good. Hall of Fame Quarterback Ricky Ray was solid completing just under 80% of his passes for 266 yards. But he’s been much better. Argos running back James Wilder Jr. was good too. 52 yards on the ground and 52 yards from the air is okay. But if you had been watching all year you’d know that he had way better games than the one he had on Sunday. Of course that great play call, throw by Ray and catch by Wilder on 3rd and 5 with just over a minute left to play was without a doubt the biggest play of the game and the one that both Ray and Wilder Jr. should be remembered for. I’d be remiss to not mention the great play of the Argonauts defence. Terrence Plummer had an interception for a touchdown. Marcus Ball returned from a long injury absence and looked to be in on every play. The defensive line finally healthy since the beginning of this season was as dominant as many, especially me, thought that they would be. And while the secondary was also good I’ll give a special mention to Canadian Jermaine Gabriel who in my opinion played the best game of his professional career. But beyond the X’s and O’s today the Toronto Argonauts enjoyed their day in the sun. They were given the spotlight of Toronto’s sporting landscape and took full advantage. The game wasnt interrupted with breaking news of a massive Leaf trade that would have garnered a “typical Argo luck” reaction. Nope on this day Maple Leaf players (Tyler Bozak and Coach Babcock aside) watched and cheered for the Argonauts just like everyone else. A classic game winning touchdown essentially at the end of regulation was a result even the biggest Argo homers couldn’t have imagined. But that’s what they got. Had they got blown out of this game the fringe Argo fan would likely have thought, “Oh well, on to the next thing.” Just think of every Blue Jay home opener that for years would sell out in minutes while game #2 was virtually empty. Often the Jays put up a stinker and could never take advantage of game 1. The Argos did that Sunday. Maybe Sunday was the unofficial game 1. But make no mistake about fans today went home with stories filled with a roller coaster of emotions. You couldn’t ask for anything more. While the play calling in the second half drove me nuts and had me screaming/ begging for a throw down the field, watching a genius execute the way Ricky Ray did on that final drive confirms the obvious. I’m a fan not an expert! All season long Argo fans cheered out loud and publicly professed that a game at BMO was special. Sunday that message was seen, heard and shared with many more people. To those who go every week, congratulations. You deserved it as much as anyone. Now some people are going to wonder if the love for all things Double Blue will extend beyond this game. My only answer to that is I hope so. But the reality is that today and the days leading up to the game the Argonauts, the TORONTO Argonauts were again part of the discussion. That might be more important than even a Grey Cup. Thankfully next Sunday the Argonauts will have the chance for both. 1 Comment on Toronto Wins the CFL East Final and So Much More. The Boatmen indeed ‘enjoyed their day in the sun’, and clouds, and even a bit of snow. The kind of experience which draws us year-in, year-out to the wonderful cultural gathering that is the CFL!